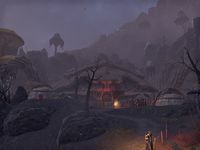 Ald'ruhn is an Ashlander meeting place found north of Balmora. It serves as a site of pilgrimage for the nomads, and is the legendary site where the last emperor crab, Skar, was killed by a combined force of all the tribes. The corpse now serves as a meeting hall. Ald'ruhn Objective: Discover the secret of the Hleran Ancestral Tomb. Ald'ruhn Wayshrine is located outside along the southern road to the camp, after the Red Exile camp. 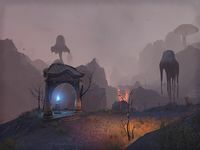 Ald'ruhn was previously seen in Morrowind, having become a large city by the third era. The reward boxes for Ashlander dailies have a rare chance to contain a Crimson Shard of Moonshadow (image) furnishing item. This page was last modified on 21 March 2019, at 17:32.